« The Federal Bagpipe Police?!? I’m in Australia for Consilium, an annual conference which is hosted by the Centre for Independent Studies. I spoke on fiscal policy and pontificated on the need for nations to restrain government spending. That’s an important message (at least in my humble option), but I thought it was more interesting to learn more about the tax and spending policies of Australia’s current government, which is led by the supposedly right-of-Center Liberal Party (Aussies still use “liberal” in the European sense of classical liberalism). Unfortunately, I learned that the Australian Liberals (like British Tories) need some remedial work on fiscal policy. Prime Minister Abbott and his team, for instance, have proposed to increase Australia’s top tax rate. Here’s some of what’s been reported by the Australian Financial Review. The Abbott government’s deficit tax means top earners will face a 49 per cent marginal tax rate, the eighth ­highest among developed countries. …. Australia already holds one of the highest personal income and company tax rates in the OECD. The 30 per cent corporate tax rate and 45 per cent personal income tax rate are higher than the average of 25.32 per cent for companies and 41.51 per cent for individuals. A personal tax increase will worsen the impact of “bracket creep”. …a higher income tax rate could also make Australia less competitive globally. And the AFR also reports that a visiting scholar has thrown cold water on the idea of mimicking European fiscal policy. So why is an ostensibly right-of-center government copying Obama’s class warfare tax policy? I imagine that strategy will be a flop, just like the first President Bush didn’t win any friends when he capitulated to a tax hike in 1990. In any event, the Australian Taxpayers’ Alliance warns that the tax hike may lose revenue because of Laffer Curve effects. “The idea of increasing the top marginal tax rate in Australia is unlikely to raise any revenue, and may actually decrease government revenue due to a shrinking in the tax base, as high-income people reduce their labour supply, investment, innovation and tax compliance,” said John Humphreys, the deputy director of the Australian Taxpayers Alliance and an economics lecturer at the University of Queensland. …“Based on mainstream estimates of the high-income elasticity of taxable income, it is fairly straight forward to calculate the tax rate that will raise the maximum amount of revenue, and in Australia that is about 45%. If tax is increased beyond that level, then it is unlikely to raise revenue, and may actually cause a drop in revenue.…” The modeling by Humphreys is due to be published in Policy Journal in the coming months. I’m skeptical about the finding that the revenue-maximizing rate for the personal income tax is 45 percent, particularly when there is very rigorous analysis suggesting that 20 percent is much closer to the mark. But I definitely agree that pushing the rate to 49 percent will backfire on the Australian government. And the folks at the ATA do make the very sound point that politicians shouldn’t try to set the top rate at the revenue-maximizing level regardless. Amen. Indeed, allow me to call your attention to some very impressive academic work on this issue. Now let’s shift to the spending side of Australian fiscal policy. The good news is that the Abbott government isn’t proposing big increases in the burden of government spending. The bad news, however, is that there doesn’t seem to be any commitment to a short-term or long-term effort to shrink the public sector. Here’s a chart, based on IMF data, looking at what’s happened to Australian government spending over the past 20-plus years. The purple-ish line is nominal government spending (left axis) and the blue line is government spending as a share of economic output (right axis). In the long run, the trend of the blue line is the most important variable. Unfortunately, the burden of government spending has climbed since the late 1980s. It’s still much lower than the burden of spending in places such as France, but the line is moving in the wrong direction. 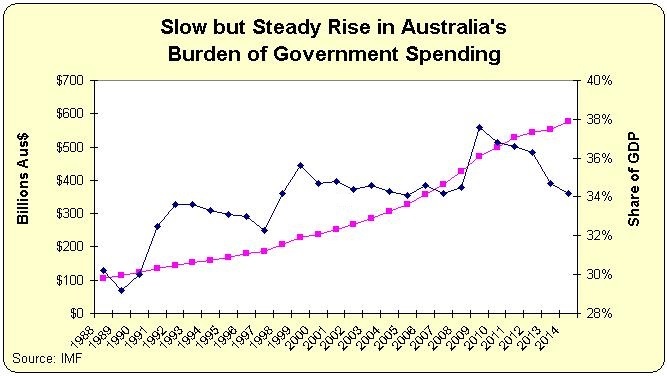 On the other hand, if you look at the data since 2000, you could accurately say that Australian policy makers have succeeded in keeping the burden of spending from climbing above 34 percent of GDP (there was some foolish stimulus spending beginning back in 2009, but it didn’t lead to a permanent expansion in the size of government). But let me share some remarkable data showing Australia’s missed fiscal opportunity. If you look at the IMF’s annual government spending and do the calculations, you’ll find that government spending since 1988 has grown by an average of 6.8 percent each year. Since nominal GDP also has increased at a good pace, the actual burden of government has “only” risen from about 30 percent to 34 percent of economic output. But imagine if Australian policy makers had merely imposed some version of Mitchell’s Golden Rule and limited spending so that it grew by, say, 3 percent annually. If they had engaged in that modest level of fiscal restraint, the burden of the public sector today would be only about half its current size. In other words, government spending in Australia would be less than 17 percent of economic output, which would be even better than Hong Kong and Singapore. This explains why I’m so fixated on expenditure limitations. You can make big progress over just a couple of decades if politicians somehow can be convinced to restrain the rate of growth of government spending. Or, as the people of Switzerland figured out, you can enjoy that progress if you impose a spending limit on the politicians. Spending limits can always be worked around, given “emergencies”. It’s time to create an incentive, such as a bonus that is 2x annual salary for keeping Discretionary $pending below a fixed percentage of GDP. This would cost about $200 million to control $1 Trillion in spending. Worth noting that while the *federal* tax rate doesn’t put the US in the top ten, that’s a bit of an unfair measure, as the US has much more spending at state and local level than, say, the UK. New York City, with federal, state and city taxes added together would be in the top ten, and getting higher. The mayor has been dismissive of the idea that people would relocate from Manhattan to Connecticut, given all the things that Manhattanites like about Manhattan (theater, museums, short journeys to work etc.) But he is pushing his tax rates much higher than global competitors to New York such as London and vastly higher than Hong Kong. As has been said many times, using the Laffer curve as a guide to prosperity is simply self destructive. The Laffer curve debates tax levels way past the growth maximizing point — which is ultimately the only important factor in determining mid to long term prosperity. To see the absurdity, look at the Laffer curves shown in the “Very impressive academic work link”. They imply that the amount of government revenue is the same at the 20% tax level as it is at the 90% tax level – which may be correct if you are simply looking at next year’s tax revenue. But what economic trajectory does a country with a 90% tax rate have compared to a country with a 20% tax rate. It’s like saying that if Singapore turned communist, it would still have the same level of government revenue next year, which may be correct. But what would be its economic trajectory? What would be its growth rate, the motivation of its people to produce, the longer term decisions they make about their careers and productivity? The Laffer curve is a crude desperate backstop to politicians that sounds the last alarm: “Look, if you increase tax revenues further, you will get lower revenue, even as soon as next year”. But if you are at that point you are already well on your way to a compounding decline. But so long as the average voter-lemming believes that “a redistribution dollar today is worth five perpetually compounding dollars in the future”, the relative decline of most developed democracies will continue. *Most* democracies, but not all. Some will get it right.